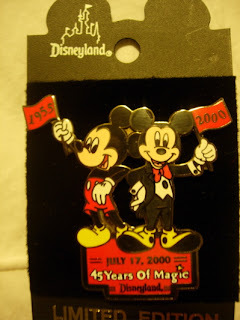 This is a Disneyland Official Pin, celebrating Disneyland's 45th birthday. It has the date "July 17, 2000", which was Disneyland's exact 45th birthday. It has 2 Mickey Mouses on it: one holding a 1955 flag, and one holding at 2000 flag. This was a Limited Edition pin, bought in 2000.